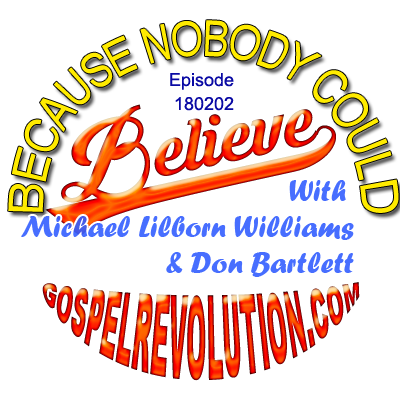 This week after hearing from Robert W Vacanti, Girma Colston, and Melvin Martin, Mike and Don discuss Hillsong’s Grammy award, Brian Houston, new ways to reach Producer level and Executive Producer level in the Gospel Revolution and finish up with a robust discussion about why unbelief is the doorway into God’s grace and mercy! Christian ministers play the guilt and sin card for the great fortunes but after they get rich none of them come clean and preach the truth, and some of them know the truth. They just do not respect or love Jesus, no way. If I had one wish for a dear friend, it would not be that they be wealthy or even healthy, it would be that they know that God has their back when they pass on. Christianity offers a roll of the dice at best and according to them, most lose. Good thing that is their lie and not the Gospel. This ministry has shown me the wealth, the Gospel. I do not worry about my loved ones as they pass. I thank God they are fine. I want to email a bunch of my friends the GR web site so the question to all you is this: What videos or teachings would you send? These are ex church people, seedy, lowly, and disgusting. A sorry lot they are, but the GR ministry can help them love themselves so it’s worth a shot. I prefer something short that is typical Mike Williams – shocking, but with a simple positive message. Like something from the Predestination teachings maybe. The power casts are great for us but they may not listen to 80 minutes of something.